Great multi-purpose glove for kids- fun design but robust and practical underneath. 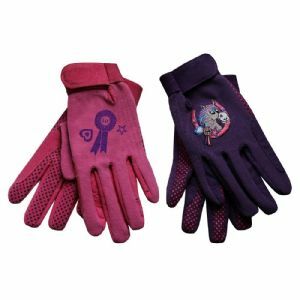 The Daewoo suede palm features polka dot rubber contrast grips, providing excellent contact which is durable yet sensitive enough to feel the contact on the reins. Lightweight with spandex back for complete comfort. Features include velcro fastening, elastic to wrist for a snug fit, reinforced suede panels to fore finger and inner fingers to prevent rubbing. Available in two colours and designs.